With our new enlarged selection of troops, thanks to James collection of ECW troops appearing, we were able to tackle a refight of a largish battle from the war, certainly larger than the West Country campaigns usually featured. Cheriton saw an outnumbered force of Royalists under Lords Forth and Hopton try to take the initiative against Waller's Parliamentarians. You can find a full account of the battle all over the web, with the Wikipedia article being as good a place to start as any. 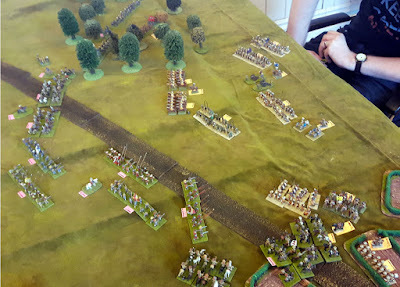 I translated the forces into 7 Royalist Regiments, one solely of muskets facing the wood, versus 8 Parliamentarian, with two Musket armed regiments initially in Cheriton wood. 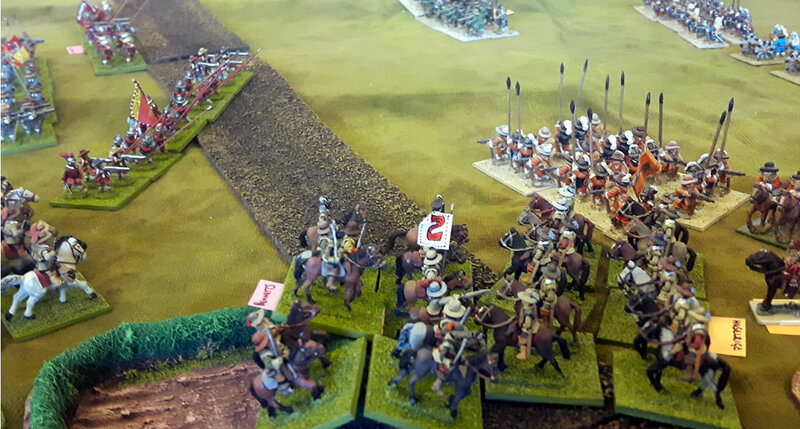 Cavalry was 4 troops to 5 respectively, with Parliament featuring a small force of Cuirassiers. 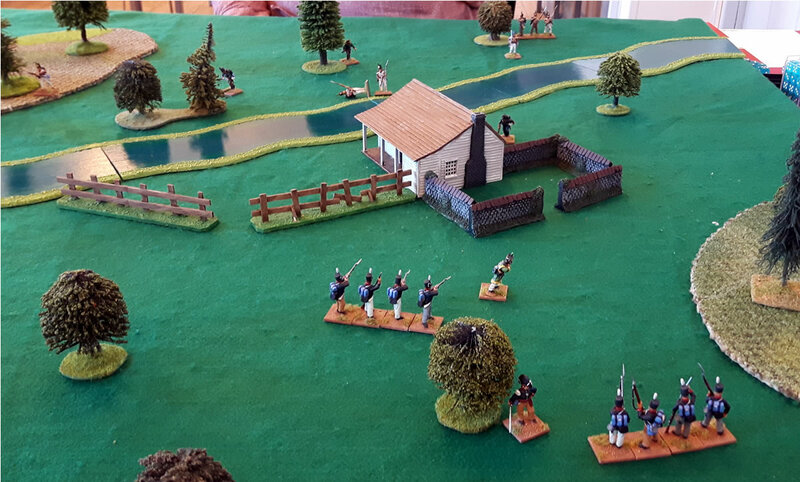 Finally the Royalists had three guns, arranged close to the woods, whilst Waller fields four, on the open ground. The initial set up reflected the situation as Waller pushed substantial musketmen from the London Bands in to seize Cheriton wood; a maneouver Hopton anticipated with his artillery and own musketeers. Myself and Gav took the royalists against James' Parliament. 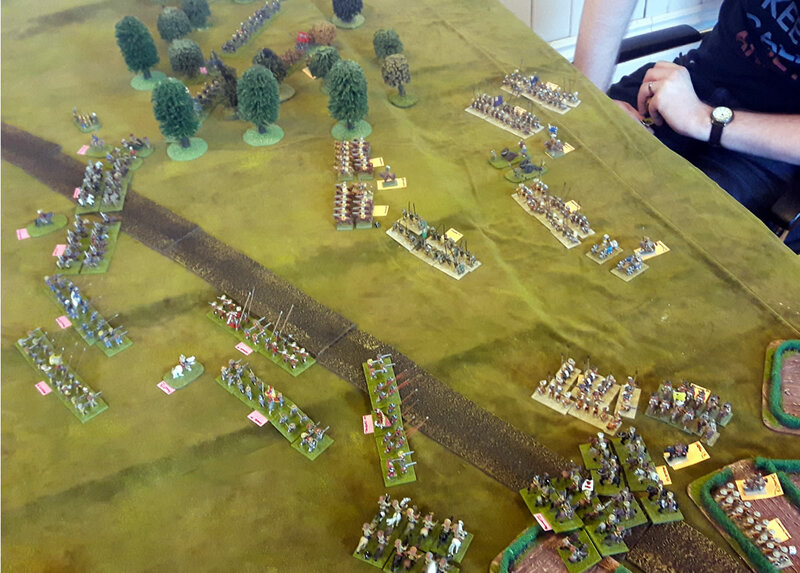 Initially it was all the Royalists favour, with the initial attack out of Cheriton wood stalled and a more general advance accross the field. 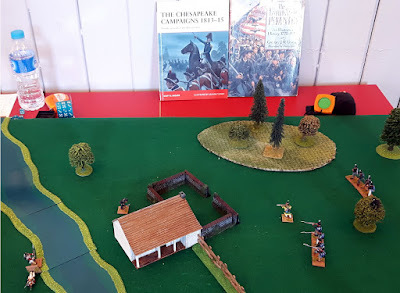 A protracted firefight would develop in the wood with Hoptons men slowly pushing back the Trained Bands over the course of the game. In the centre, Waller used his cavalry to try and punch through the Royalist left, whilst the Royalist cavalry on its' right attempted to clear the fields. Extracting the Parliament foot from the fields was a slow business, and resulted in a cavalry clash on the Cheriton road. In this the Parliamentarians had the better of matters, and whilst the Royalist Left was ascendant, it was slowed by terrain, and at the same time its right was falling apart. 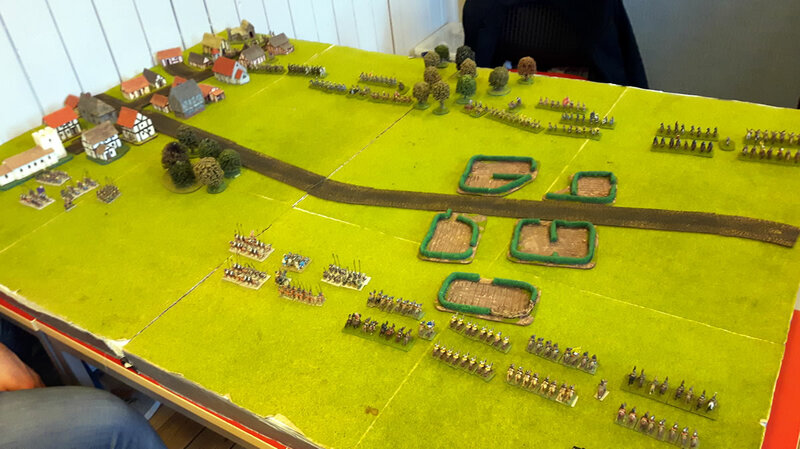 With time against us, broken forces on the field would imply a defeat for the Royalists, but in operational terms it was probably more of a draw, or a stalemate. The Parliament infantry proved reluctant to advance despite its' units being factored slightly stronger individually, and in numbers over their opponents. However with markedly reduced cavalry numbers, Hopton could no longer cover his flanks, and so his advance in the open ground had stalled. 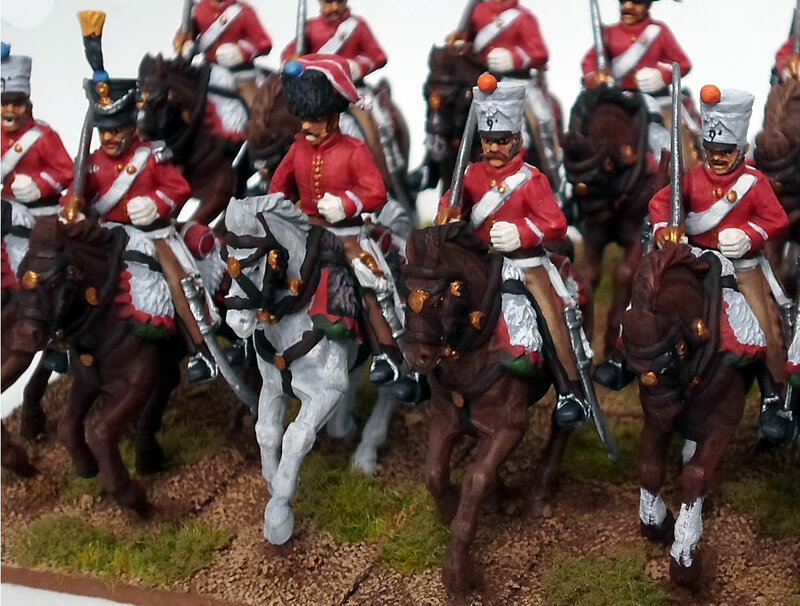 The 9th Bis Hussars were a French Cavalry formation that served on many fronts, but was stationed in Spain around 1811-12, including service at the Siege of Valencia. I made and painted these as Hussars in campaign equipment, using the new(ish) Perry Chasseurs set, per their recommendations. The Bis, as it's name suggests, was only a partial regiment, with about half the normal complement. The rest of the troops being siphoned off to Russia. In campaign equipment these troops appear to have worn scarlet coats and brown - Spanish cloth - overalls. Consequently I chose not to put the trumpeter in reversed colours. Though to be fair, if he was, you'd scarcely tell. The facing red is almost the same as the main coat colour. I did choose to place the elite company in Fur Busby's however. This seemed reasonable. This brings me up to 4 French cavalry regiments now. Which is starting to feel more useful, I think more are required yet, but it may be a return to infantry units next. 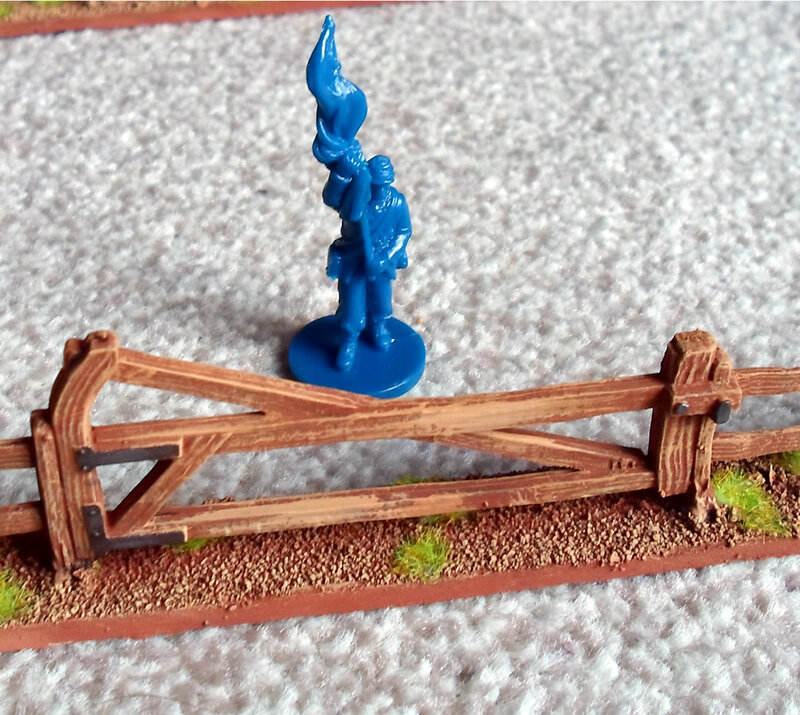 In my blogging downtime there were a number of games, more than I bothered to get photo's of actually. In no particular order here are a few. 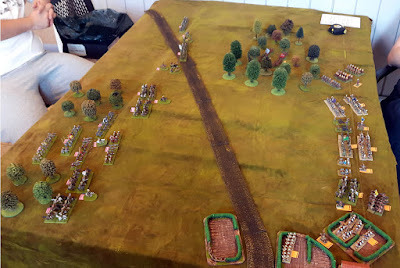 A war of 1812 Skirmish game was an opportunity to play a Napoleonics game at a smaller scale. American Infantry, including Rangers and Militia try to seize a farm from those devious British. The British would prove victorious on this occasion however. We used Song of Drums and Shako; which work, but are rather too slow and lacking in character given how small the formations are. I feel there is work to do finding a set that works for us; suitable for 10-30 miniatures a side, with individuality but playable in three hours or less. 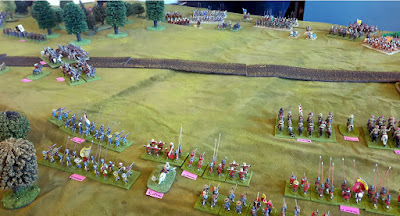 We've also played a couple of English Civil War games, in 15mm, using Black Powder. 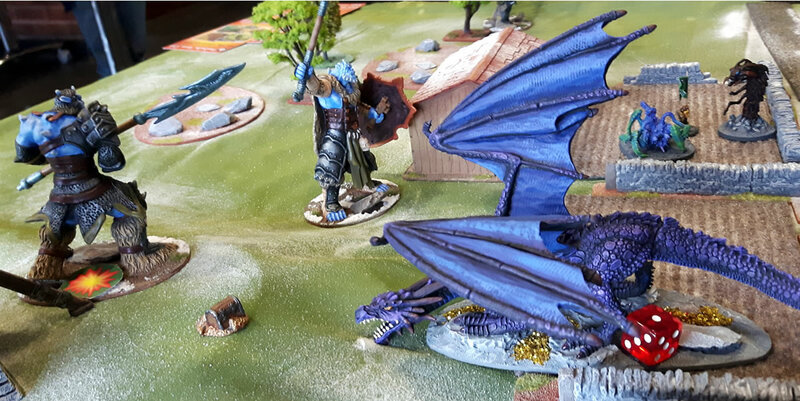 James T, one of my regular opponents inherited a classic collection of miniatures and so our games can stretch to grander encounters. We played with my usual one page of modifications to BP, which is all I feel it needs to cover the mid 17th century. 'Pike and Shotte' are wholly unsatisfactory, and this modification at least ensures we all know the rules we are using. 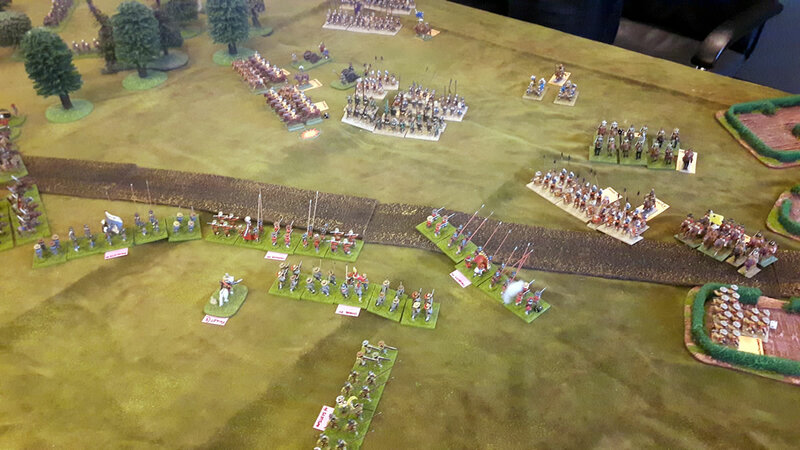 Lastly, going waaaay back, here are a couple of shots of my display game at Pudsey Recon. We played Dragon Rampant, using my Kobolds and Giants in a couple of epic struggles. Honours ended even on the day with both me and Gav winning a game; or alternately as a whitewash, with the Giants winning both games. The snow/frost effect is nothing more than Bicarbonate of Soda, which worked quite well as a quickie effect. 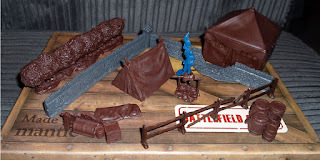 What feels like an eternity ago I put in on a Kickstarter for Mantic Miniatures, based on plastic terrain pieces. Well, they finally arrived. And they are, pretty good. There are probably more than 80 pieces in the set, including a dozen wall sections, six fence sections, three each of the tens, a horse and cart, supplies and battlefield detritus. It is a fairly firm polymer plastic, much like modern board game miniatures tend to be made from. Some pieces arrived warped out the mould, but treatment with boiling water, then dipped into iced water works well to allow for straightening. The parts naturally want to return to the shape of the mould. I managed to get paint on some of the simplest pieces this week. I think they work pretty well. 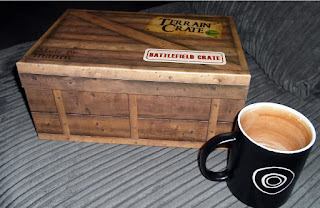 This boxed set cot me about £45, the individual sections of which are beginning to appear on their website priced from £8 and up, however all told the Kickstarter crate is probably worth about £80-100; so I'm happy I got one how I did. 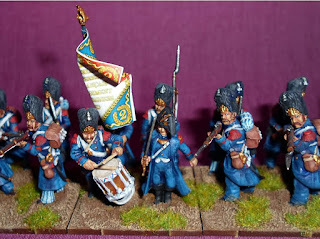 So I promised something Napoleonic that was a little different, and here it is. The Ojibwa were one of the tribal nations of the lower Great Lakes, part of Tecumseh's coalition of disparate tribes fighting for the British against America, ostensibly on the promise of an independent nation in the event of victory. The painting technique is my usual style, but the warpaint was applied as a thin glaze and then highlighted again, over he finished flesh tones. This seemed to work well enough. 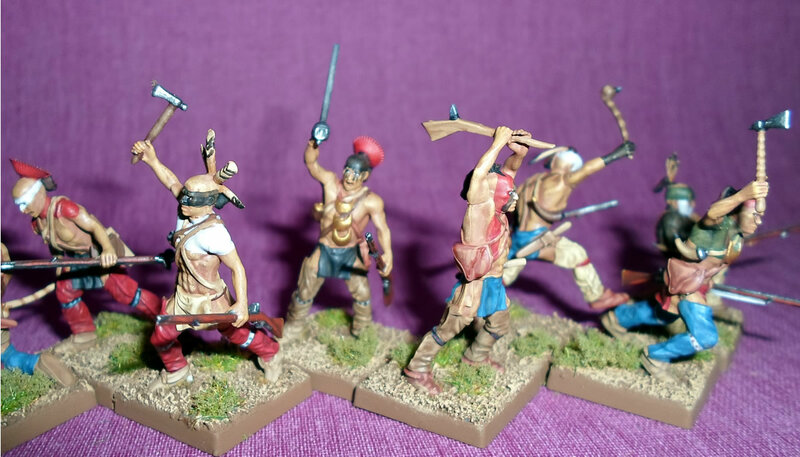 These are more of the delicately proportioned, crisp, Eagle Miniatures range. A decent match for Perrys, but a little slight next to my Front Rank models. 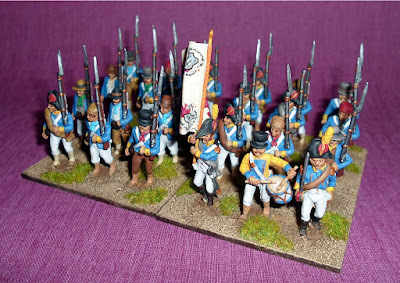 Valencia militia are described as favouring golden yellow facings, and sky blue coats were a common issue from British stores, so this otherwise hypothetical uniform is founded on likely regimental outfits. Indeed a search for contemporary images will represent many a Spanish soldier of the 1808-14 period deported as such. So whilst I've not been blogging so much, I have been painting a bit more; despite an ongoing indulgence in video gaming, most notably War Thunder over the past six months. 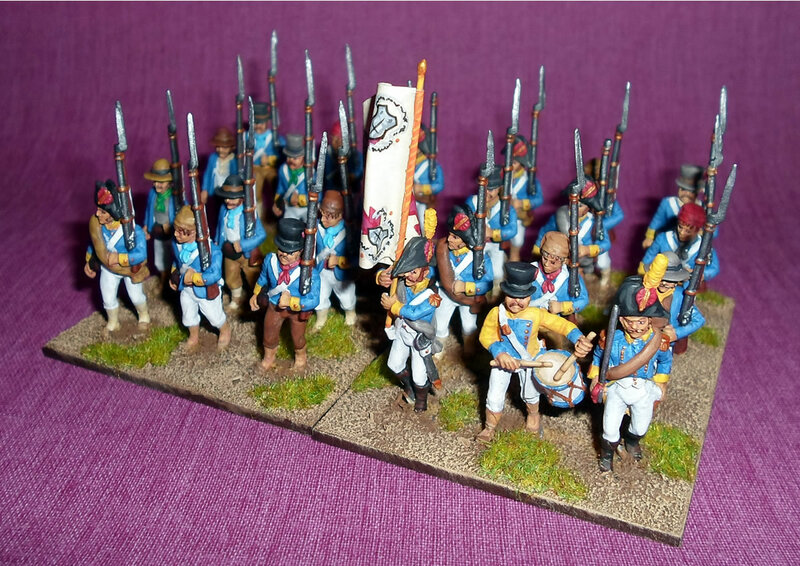 Anyway, the next Napoleonic unit to make an appearance is the 2eme Gaurd. 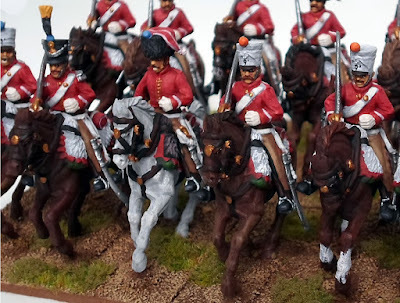 Unlike my other units, these never appeared in the Peninsular, but they can serve as the 2nd battalion of my principal guard regiment, so it's not a problem.